Death rules this land. From the white-hot sun baking the earth, to an empty noose swaying in the skeletal branches of the hangman's tree, to bloodstained buzzards circling overhead...the Wild Southwest thirsts for souls. Make sure it don't get yours, amigo. Stone and an Hard Place is a setting book for Deadlands. 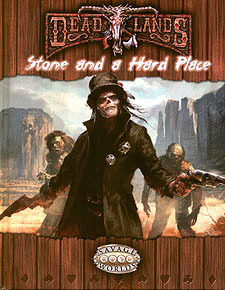 It details the strange locales of the American Southwest, provides Edges and abilities to gussy up your Harrowed or hexslinger, Setting Rules to emulate Death's grip on the land, Savage Tales galore, a passel o' terrifying abominations, and an epic Plot Point Campaign that pits a posse against Death's red right hand - the one and only Stone! This book requires the Savage Worlds core rules, the Deadlands Player's Guide, and the Deadlands Marshal's Handbook to play.